Among magic's most exciting and innovative performers, Jeff McBride combines masks, pantomime, martial arts, Kabuki theatre and various other performance disciplines with world class sleight-of-hand to create magic that is not simply mystifying, but dramatic and deeply moving. McBride's show Magic at the Edge, had highly acclaimed runs at Palace Station in Las Vegas, in Laughlin and Atlantic City. His unique nightclub experience, McBride's Wonderground is now in it's tenth consecutive year, every third Thursday, at the Olive, on E. Sunset in Las Vegas, where it continues to grow and generate buzz as Las Vegas' most exciting alternative magic and performance art venue. "Possibly the most influential magician of our time." A recent appearance on The World Magic Awards (Best Classical Magician), many featured spots on Masters of Illusion and McBride's participation as a judge on VH-1's Celebracadabra are just the latest in a string of television appearances covering every major network. He even went where no other magician has gone, as a special guest on Star Trek-DS9! 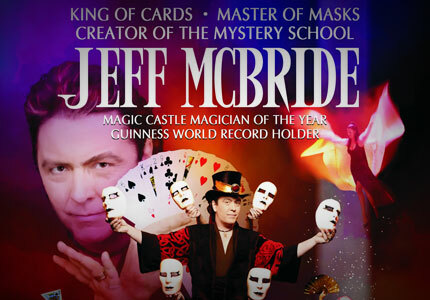 In addition to his amazing capabilities as a performer Jeff is the founder of the McBride Magic & Mystery School, as well as an accomplished creative consultant, teacher and lecturer. He travels the world performing and teaching, building an extensive network of enthusiastic fans in the magic, performing arts, corporate theater and academic worlds. "McBride is easily the most exciting and mesmerizing magician I’ve seen in years. Light years ahead of the pack!" Jeff McBride's Wonderground magic nightclub recently celebrated entering its 10th year of operation! The Wonderground takes place every third Thursday, at The Olive on East Sunset. Hosting luminary magical and other performance artists as well as the Press and fans of magic, the club is often frequented by such luminaries as Mac King, Robin Leach, Criss Angel, Lance Burton, Xavier Mortimer and others. Copyrights © 2017 All Rights Reserved by McBride Magic, Inc.